Paulinho was part of Luiz Felipe Scolari's side in 2014 as they were humiliated by Germany in the semi-finals, losing 7-1. SOCHI: Brazil midfielder Paulinho believes his side are in much better shape heading into this year's World Cup in Russia than they were as the host nation four years ago. Now 29, Paulinho was part of Luiz Felipe Scolari's side in 2014 as they were humiliated by Germany in the semi-finals, losing 7-1. He came off the bench in that match and is one of only four players in Tite's squad this year in Russia who appeared on that fateful night in Belo Horizonte. Thiago Silva was in the squad but was suspended, while Neymar was injured. Brazil come into this year's tournament, and their opening game against Switzerland on Sunday, having lost just once in 21 outings over the past two years. "We have greater confidence. From the way things are going for the Brazil team at the moment, it is clear that confidence is better," the Barcelona midfielder told reporters on Wednesday at the team's training base in the Black Sea resort city of Sochi. "Brazil are better prepared in a number of ways. That is just part of football -- in four years you learn a lot of things." "What we have done in these last four years is put the past to one side," he added. "Now we have another opportunity and I want to do better. That is life. Football is good because it gives you other opportunities very quickly." Since 2014, the former Tottenham Hotspur midfielder has had a spell in China before moving to Barcelona last year. That move came as a surprise to many but he has enjoyed a successful season in a Barcelona side that won the domestic double and is now one of the older heads in the Selecao. However, he said coach Tite -- under whom he played at Sao Paulo giants Corinthians -- was keen to "divide up" the responsibility between the younger and the more experienced players. 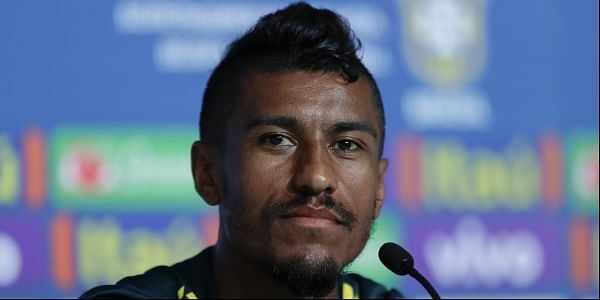 "A player who has never been to a World Cup can bring their own experience, give something to me as I come into my second World Cup," said Paulinho. "When I went to play at my first World Cup, one of the people I sought out to speak to was Thiago Silva, who is my friend and someone I care about a lot. Or Daniel Alves. "But regardless of whether we have played one, two or three World Cups, there is something to transmit. The great thing about the Brazilian squad is that everyone adds something." After facing the Swiss in Rostov-on-Don, Brazil also take on Costa Rica and Serbia in Group E.